The fastest way to find your life purpose and live your best life is to find your superpower. You have the capacity to be and do something amazing in a way unlike anybody else - a superpower. The reason I am here, and the reason you are here, is our superpowers. Your superpower is at the core of who you are and what makes you special; it is your greatest gift, and also your highest calling. So many people spend their whole lives searching for who they are supposed to be, what their purpose is, and what they are supposed to be doing in the world. I don’t think that life should be spent finding your purpose. I think it should be spent living it and using it to create your best life, and your superpower is at the center of that. You just need the guidebook and wisdom to find your superpower and bring it out. The Superpower System is that guidebook. It gives you the map for discovering your authentic self and your unique, amazing, capabilities - your superpower and life purpose - and then the ways you can go out into the world and use your superpower to live your best life. The Superpower System is a journey of knowing yourself, growing yourself, and clearing yourself. Each of these parts of the superpower system has a unique role in helping you find your life purpose and live your best life. Know Yourself is where you become familiar with your authentic self and find your life purpose, your superpower. Grow Yourself then gives you the ways you can use your superpower and what you have learned from Know Yourself to create and live your best life. Clear yourself then helps you clear away any self-sabotage or limiting beliefs that might keep you from getting there. It is an adventure of epic proportions, and one you have been waiting to go on your whole life. So don’t wait any longer! Find your superpower! Your best life awaits! Know Yourself is where you find your life purpose - your superpower. Know Yourself involves finding what is at the core of who you are, your personal core values, your top strengths, and your social currencies, so that you can know your authentic self, and then using that knowledge to find your superpower. Your superpower is then your life purpose. Your superpower is what you have to offer the world that no one else can, and what you are meant to be doing in this great big adventure called life, and it sits at the heart of what you are most passionate about. When you know who you are at the core, then the rest of life opens up for you and the symphony of joy, abundance, good health and miracles waiting to show up in your life can begin. 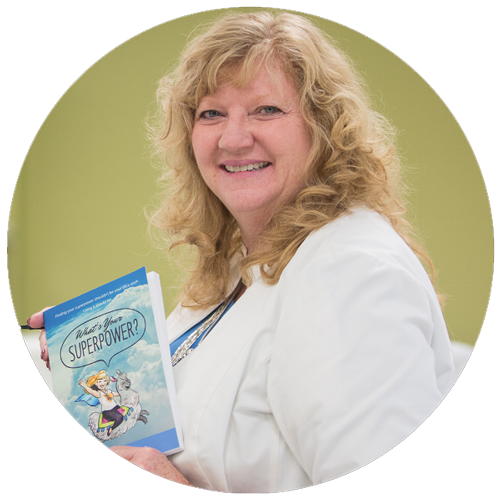 The parts and pieces of the Superpower Model are explained in Chapter 2 of What's Your Superpower? Below you will find resources to help you get started! Once you know your superpower, you will know your authentic self and your life purpose. And now that you have those answers, the real fun begins. Living the life you were meant to lead! Grow Yourself has tips for leaning into what you have learned to create the best life you can imagine. You have your superpower and your life purpose in hand. You see with clarity that which you have never seen before: who you are and what you are supposed to be doing. So now what? How can you take what you know and turn that into a your best, most amazing life? In comes Grow Yourself, the second piece of the Superpower System. Grow Yourself is about creating your best life by aligned what you do with the deepest and truest parts of who you are. It is about standing on your values, strengths, social currency, and superpower and leaning into all that you are. The wind is a perfect metaphor. Each one of us experiences wind in life. It is called resistance and the life path offers resistance from every corner. Thus, the lean in consists of two forces: our own energy used to push forward into the resistance and the force of the world as it pushes back on us. In the Superpower System, Grow Yourself provides eight different ways (although there are always more) to grow and step into your best life. All of these ways are explained in detail in Chapter 3 of What's Your Superpower? Below you will find some of the most important lean-ins to help you create your best life! Live your best life in 7 powerful steps: includes finding work that aligns with your values, making life decisions, creating a life plan, and more! Once you have gotten awesome at leaning in to your Superpower, you will find that life is more exciting and fulfilling than ever! You know your life purpose and you have been stepping into your best life. But something just keeps getting in the way of you reaching a new personal best. What is that? Clear Yourself, the last stage of the Superpower System, is about clearing the forces that make us self-sabotage and keep us from stepping into our best selves and leading our best lives. One of the biggest obstacles to living your potential and making significant change in your life is what I call the language of the wound. The language of the wound is the sum of all the hurts you have accumulated over the years at the hands of the different people you have encountered. It is what limits you from transcending your previous life patterns and living your best life. The language of the wound comes from three separate forces: the Intellectual Scrap Heap, the Emotional Scrap Heap, and the Energetic Scrap Heap. Each of these are described in Chapter 4 of What's Your Superpower? as well as in the resources below. These forces and patterns that limit us have been given many names - stories, wounds, behavior patterns, limiting beliefs, self-sabotages, language of the wound, etc. - and you may think of them differently. That is fine. Feel free to label your karmic scrap heap in the way that works for you. The goal here is to work through them and clear them so you can step into today and embrace the possibilities that await you. There is a lot of material in each bucket of the scrap heap to be chipped away. It is safe to say that I could write a book on each topic and many people have. To keep it simple, in each bucket I highlight what I call the head of the river. The head of the river is an idiom. It means the source of the water. I tried to find the source of the karmic scrap heap to clear it there. Working through your karmic scrap heaps is essential to living the authentic, purposeful, and incredible life that you are meant to lead. It is a continuous journey, with each new level you reach being more incredible than the last. The journey is worth it though, and by knowing yourself, growing yourself, and clearing yourself, you will soar to new heights! You can find more resources for knowing, growing, and clearing yourself in the Gold Mine. Follow me on social media and sign up for my newsletter below to get empowering Llama Wisdom right in your inbox!